CSD is excited to be a part of the football season again this year. We have added several teams to our roster of partnerships. The most recent addition is the Buffalo Bills. Additionally, the Oakland Raiders have joined us in the quest for success. See all of the Partnership Teams. In order to please fans and reach more people, CSD has suite drops in stadium across the country this year. If you’re lucky, you may just get to take your own home! It’s important to us that we stress our custom framing above everything else. 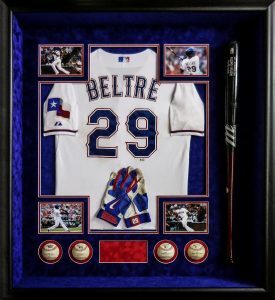 We are not just a sports framing store– we are much more than that. My favorite pieces include our framed guitars and amazing photo collages. The excitement of sports is difficult to top! We understand that, which is why we try to show off all aspects of our framing, including beautiful sports memorabilia frames. Hopefully, in the years to come, CSD will evolve into a household name. We are passionate about what we do, especially in fixing other company’s framing mistakes. Every company evolves along the way. We believe that if you shoot for the moon you will land in the stars. Case in point? Our jersey framing packages have done wonderfully. It was important for us to offer to our loyal customers quality jersey frames that are affordable and truly top notch. Who knows what the future holds for CSD? Perhaps we will create more amazing packages, sure to suit everybody’s tastes. The best part about being at CSD is seeing how happy customers are when their prized possession is shining in a new frame. This entry was posted in Company News and tagged CSD, custom framing, jersey framing packages, partnerships.